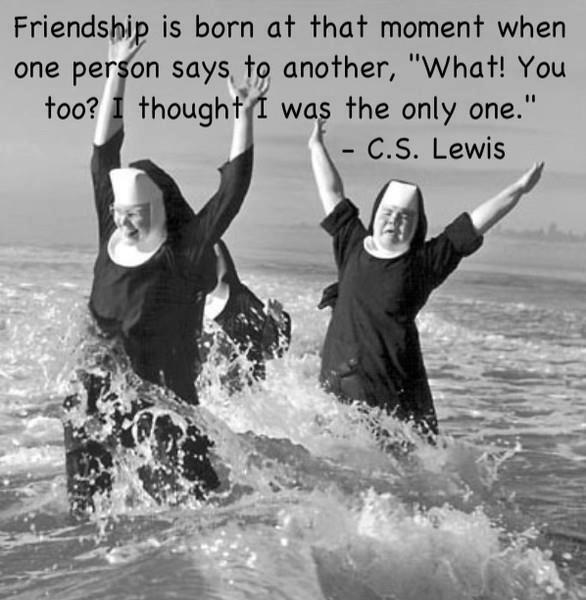 Friendship Is Seizing The Moment Together! This picture has now been placed up there on my list of favorites right along with the monks on the roller coaster! Just having arrived back from a multifaceted trip to the San Francisco Bay area to see two of my 3 sons and celebrate the aliveness and beauty of my two grandchildren I am taken once again with the possibilities that are nested in each moment. There are many moments that stand out for me on this trip and one of them reflects the C.S. Lewis quote above, as well as the nuns in total abandon saying YES to what they most certainly individually thought of, but may have been afraid to take action on alone. Have you ever had a moment when you have a thought to do something “out of the box’, look at someone and just know that they are thinking the same thing? What could have been a pretty BIG leap for you alone just turned into an adventure shared by another. The fact is that you also get double the pleasure, fun, and joy in seizing the moment together…… creating a bond that may be momentary….or may last a lifetime. Before immersing myself in family during this trip, the ocean called me loud and strong! Thus the day after I arrived was a day for breathing in salt air, walking at the waters edge, laying in the warm sand, simply being present to the sounds of the waves, and delighting in the spectacular day. I can still feel the smile on my face as I walked down the so familiar beach at Salmon Creek feeling the exhilarating cold water on my legs. Visual memories flooded in. There were so many times a Sunday group of women I had gathered together, called Babes In Wetsuits, would ride the top of waves screaming with joy while careening into shore. Now you must understand that I was born and raised in San Diego and the beach to me was home. The salt water my bathtub. Keeping this in mind you will understand this little tale I will now tell you. While reluctantly walking back along the shore to my car parked high up on the cliff side parking lot I lingered just a little longer in the surf as my feet sunk into the wet sand. Just before me was a woman that caught my attention because of the huge smile she had on her face. This grown woman…it turns out Teresa from Salt Lake City, Utah…was gazing at the water running over her feet and the waves coming into shore with complete and utter joy. I knew this feeling and was drawn to talk to her for a bit. Starting the conversation with, “isn’t this all so beautiful?”, I learned very quickly that she was entranced by this watery and sunlit world. Teresa spoke easily of her love for the ocean and the mountains and wished that she could have both, upon which I said that there are indeed places in the world where there are both in the same location. We mutually agreed that life is way too short to hold back from stepping through the open door when opportunities are presented. Although our legs were wet what both of us really wanted to do was dive right in. In a way we did by communicating that with each other. With a touch on a shoulder we went our separate ways enriched by the connection made in the salt water of the Pacific ocean. If Teresa from Salt Lake City, Utah ever reads this post – please know that there is a playmate ready to dive right in. You are not alone! This post is important. Important because women are being called to step up into their full expressions as the awakening on our planet spirals out globally, and as we build a new world with very different foundations. We as women have an important purpose in all of this – to foster collaboration from the heart and soul; to speak out on behalf of the planet, our children, communities, and each other; and to express every bit of the creative genius that we are holding onto inside letting go of the fear that no one will recognize it for what it is – wisdom much needed right now! Given all of this we cannot proceed, or pass GO as the game of monopoly states, until we heal the relationships with the women in our lives. I believe that if we do not have closure or understanding with those that we have had challenges or break down of relationship with, then we are bringing our wounds to the table, and not releasing those that have been close to us, and ourselves, into fullest expression. As women we bond easily, fiercely, deeply, and often tenderly. Relationships with other women are at the core of our thriving and full acceptance of ourselves. Without healthy relationships with women we fall apart within and without. Our culture, community, and world suffers…and so do we. between two very powerful women – Oprah Winfrey and Iyanla Vanzant. Feminine Power hosted that very same day a conversation with Iyanla on “Woman to Woman: How to Heal Our Relationship Breakdowns with Each Other”. I bring you the link here to listen to the conversation as I feel that it is vitally important that we do this work with each other first! Late in 2010 I lost a friend that was very dear to me. She simply stopped communicating with me after 2 years of a meaningful friendship and many adventures. At first I attempted to create story – in other words think of the ways in which I might had offended her, or figure out why she did not want to relate any longer. I left phone messages, wrote e-mails and left a letter at her doorstep at Christmas time…but no response. Then I realized that she was not going to respond, and that it was time to do my own internal healing around the loss, move out of any story, recognize that there was no longer a resonance which kept the relationship alive and growing, forgive myself and her, and let go. 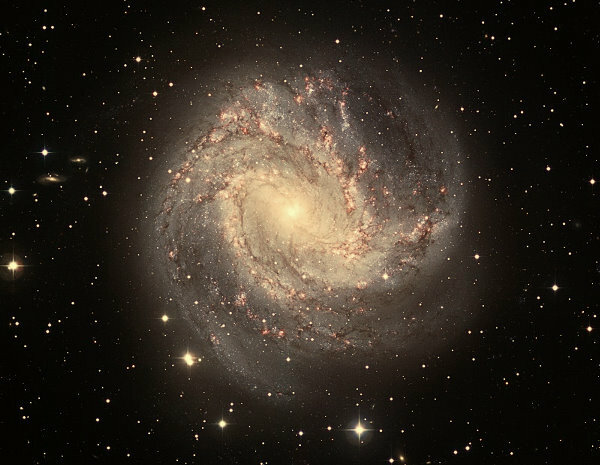 There was of course sadness around the loss of the relationship…but what really hurt was that we could not come together, face our fears, and deeply listen to each other with an open heart and mind – either for closure, or for expansion of relationship with each other or with ourselves. This is what Iyanla speaks to in the conversation on this link. 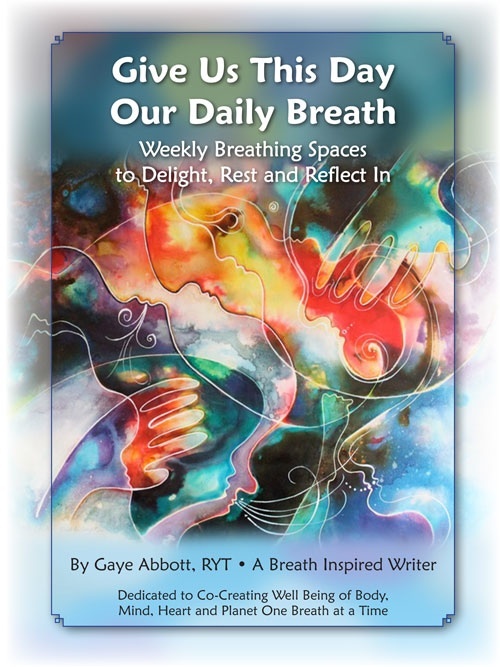 Take the time to listen in and reflect on whether there are any relationships with women in your life right now that require letting go of the fear that you carry and with courage (action taken from the heart) telling your truth. Welcome to the recording of our special Women on The Edge of Evolution event with Iyanla Vanzant, who shares the challenges, lessons and blessing of healing the relationship breakdowns with our sisters. 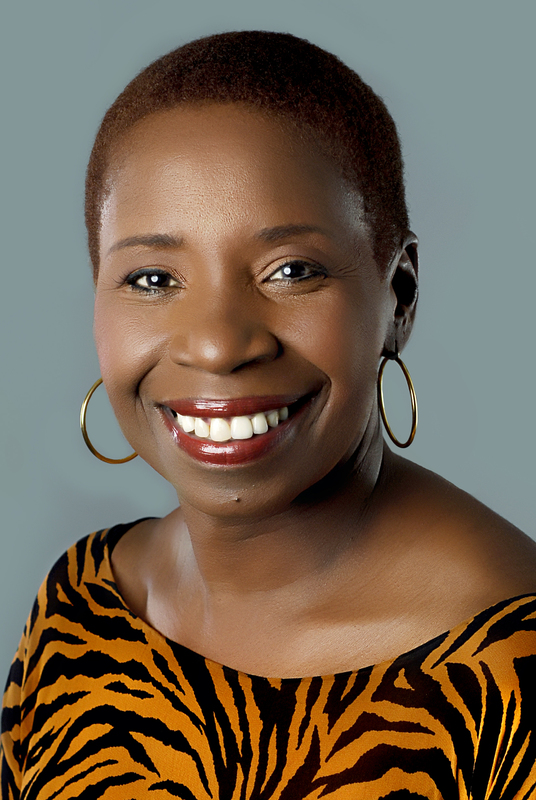 Iyanla Vanzant is the author of five New York Times bestsellers. Her most recent book, Peace from Broken Pieces: How to Get Through What You’re Going Through is a masterpiece of hard earned wisdom and a tribute to the resilience of the human heart. JUST LAUNCHED! www.DivineWealthJournal.com Recent Post: What Is Divine Wealth?